Knowing you have a choice means a lot to us at M&M Wine Grape co.. We are no different than you, when making the decision as to why we should work with a particular individual or company and because we are aware of that, we operate our business with a focus on the value that we can bring to a business relationship. 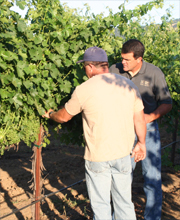 Quality, consistency, reliability, economy, and security are the reasons to work with M&M Wine Grape Co.
Quality - providing products that are fresh and packed perfectly; expectations we have groomed into the relationships we have with suppliers over the many years we have been in this business. Reliabilty - knowing that we will follow-through on getting you what you want when you need it. Economy - leveraging the benefits that come from more product options and more favorable logistical options, as a result of our many customers. Security - knowing that we work with many customers like yourself and that we do our part to support your business; being able to offer a Plan B should crop volatility rear its ugly head. The collective interests of our customers have allowed us to develop an extensive network of reliable suppliers who understand our standards for products. Those standards are a reflection of your standards, which we work to make sure are met. Each year when we visit our California suppliers, we review the forecast for the upcoming year and results of the year prior. We work with these suppliers to ensure high product quality from the vineyard to you.